Free-space optical (FSO) communication is a promising candidate to lighten the load. FSO uses visible or infrared light to wirelessly transmit data through open air as opposed to using cables, which have limited bandwidth. The new technology provides a low-cost and low-power alternative to traditional radio-frequency wireless data links. At high power, near-infrared wavelengths can damage the human eye, and they are hampered by atmospheric scattering and absorption. Razeghi, who leads Northwestern’s Center for Quantum Devices, has bypassed this issue by using mid-wavelength infrared radiation, which can benignly and flawlessly transmit through fog, smoke, and clouds. 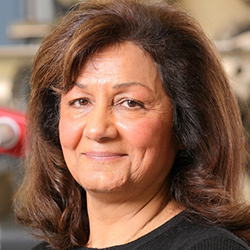 Razeghi and her team have developed an extremely sensitive mid-wavelength infrared photodetector that has potential to replace near-infrared FSO communications links in many applications. Called a phototransistor, the novel device is a combination of an electronic transistor and optoelectronic photodiode. On July 12, the research was published online in Applied Physics Letters. Abbas Haddadi, a postdoctoral fellow in Razeghi’s laboratory, was first author of the paper.